Keeping your properties up to date can be expensive, but there's no denying the appeal. Prospective tenants love the smell of fresh paint and the novelty of new appliances. Few property managers can make upgrades every year, though, so we're tackling small renovations in this week's post. Scott Safadi of Cal Bay Property Management says they're the key to balancing the old with the new, the pricey with the affordable. So which small renovations should you consider investing in? Start with cleaning your properties as thoroughly possible. It's not a traditional renovation, per se, but cleanliness will provide you with a great blank slate on which to build. From there, invest in small kitchen and bathroom projects. While total overhauls of these rooms can be expensive, changing out light fixtures or faucets can do wonders for an older unit. The best part? You can chip away at these upgrades, replacing one old sink at a time. 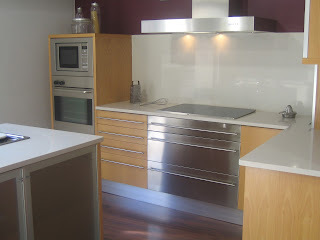 Cabinet choices are also an easy way to change up the look and feel of your property. Good storage is always a priority for tenants, but it also needs to look good once the doors are closed. Invest in modern cabinetry with little embellishment - they'll age better and give you a better bang for your buck!